Buying a house and moving, it's been said before that this must be one of the most painful experiences in life. I think it's actually made more stressful because of the all the legal hurdles and the way in which it all happens. The English version (the Scottish one is much better) requires your solicitor to do lots of work with searches and checking previous authorisations, ensuring proper title etc. This is all fine and of course, quite understandable. You need to know exactly what you are buying and the mortgage company or lender needs to know that the property is a sound investment. However, when did the completion date (the date you actually move) become largely set in stone well before contracts have been exchanged? The, more sensible, approach used to be that the solicitors did all the work, drew up the contracts and then agreed the completion date with all parties at the same time as exchange of contracts. Now you often have to commit yourself to paying for a removal company, redirection of post, changes to utilities etc. even before you have any contract exchanged whatsoever. This strikes me as a little bit daft... Apparently, it's become quite normal for the exchange of contracts to occur just a few days, or even hours, before the move, leading to massive amount of anxiety for all concerned. Solicitors shouldn't go along with these practises, even if put under pressure by clients who 'bully' them. Even better, the Law Society should insist on a minimum period between exchange and completion (unless all parties agree a lesser period). Perhaps then the process of moving home would be less painful. Most house buyers get too involved in the initial excitement of finding their next property to fully consider, at the outset, that they will need some time to finalise everything - AFTER contracts have been exchanged. It seems to me that the whole profession of Solicitors live with totally different rules, morals and working practices than the rest of us. I would love to hear from a solicitor who had had even one of the above problems. My niece ( the one above who was moving today) is a single career nurse arranging this move herself for the first time in property exchanging, she's finally given in to the frustration and is in tears and worries now if she will get to do the move or if the prospective purchasers on her house are in their right minds! Her solicitor, in a third telephone call mid-day today, told her that the buyers weren't even aware that they should be moving today and had been unable to find a removal company at such short notice - who exactly is telling the 'porkies' the solicitor or them! I'm going home now and I'm taking my niece with me, I can't leave her as upset as she is and alone. Someone should be told how much misery they have caused here today, and I hope they have a similar experience one day, at the very least, I can't say here what I really would like to say!!!!!!! My niece was told that her move would happen today, then mid morning was told that it would be another week! We were waiting for the removal men and charity people taking other furniture and been and gone with the said furniture!!! My niece was later today told by her solicitor that should the buyers not move next Tuesday (13 November) they will forfeit the 10% deposit to my niece, she want the move to the house that she has arranged a mortgage for! We wanted to move in 2015 but house needed remedial work done under warranty. Many houses in same estate needed the same work which required being out of property for 3/4months. NHBC had problem finding alternate accommodation for each family while their house was being repaired. Solution: rent our house to NHBC to use as accommodation for each family in turn so that they did not need to move away from area, our house went to back of queue, we could move (used all our savings to do so) and when our house was finished it could be sold. Work completed July 2017, house on market, found buyer October, no chain. Great - or so we thought. Turns out although a warranty had been taken out for the work, no completion certificate had been applied for even though we had a new warranty from NHBC and also from company who had repaired the floors. Can't sell without a completion certificate. After hounding the council's planning office and the NHBC who were hounding the contractors to apply for the certificate, the application has finally been sent to the council who have approved it, but have not yet sent the certificate to my solicitor. This single piece of paper is holding up the sale and in the meantime I am paying full council tax on a property that has been empty since July, insurance on an empty property and utility bills on an empty property where I have to run the heating system to stop pipes from freezing. As I now live 265 miles away I also have to have someone check the property every week or my insurance will be invalid. Technically my buyer could walk away from the sale and I could then have solicitors bills for work already done and still own a property that I cannot sell because of not having a completion certificate. Wonder if you can help. The buyer of our house has sold their to a first time buyer. Great small chain so we have had an offer accepted on our dream home. Before instructing the legal side, our buyer informed me or a precise day in July to exchange contracts which exceeds the normal 8 - 10 week window I have read. The issue I have is that the firs time buyer if not "flexible" due to holidays and rent notice but that impacts the whole chain. Advice please on how to approach this? After being bullied buy the sellers into waiting 5 months from a whole number of excuses from our house purchase in Benfleet, on the day of the exchange the sellers pulled out knocking the legs from all in the house chain, therefore leaving us like others out of pocket and the frustration of starting again, this system must be tightened up surely to protect all concerned, I understand there should be a cooling off period for all, but you are selling and buying property you must know what you are doing, there needs to be sum sort of protection in place so nobody wastes time or money in the property market. I'm very furious at the moment. can I pull out of this purchase and will I incur any penalties. Obviously not my fault! Is anyone have the nightmare am going through i sold my house 10 wks ago got told average complerion 8 to 10 wks just been told possible another 2 wks, but my solictor has just said cut off time when near xmas is around 3 wks before xmas, in total why has it took nearly 3 monthes to sell a house, we are only in a chain of 3 the to previous in chain are further ahead it will sicken me to pay a bill in total with estate agents and solicitors of nearly 2k , not looking good to having it completed till new year new, leaving me in a right mess for xmas surley it shouldnt take as long as it does. After reading these, I couldn't agree more. The lack of communication is infuriating. We have been waiting to exchange for two weeks although no one will ever actually address a clear date to get this wrapped up. The goal of the whole process is to work towards a completion date but it seems like a taboo subject. How are you meant to get stuff sorted? How is this legal in the UK? Can you sue the arrse off those who have lost trace of your money? Has anyone every heard of this. I am selling my house to first time buyers and I am buying a new build, simple so you would think!!!! Exchanged contracts on Wednesday the 7th of Aug 2013 with a fixed completion date of Wednesday the 14th of August. So on the day all appeared to be going well. We packed up the house and moved all our stuff over to the new house. Had to sit outside until we had word of completion. So all day I was on the phone chasing both solicitors to move the money. 330pm I get a call that my property has completed and the funds are now in place to buy my new build house. 530pm get a call. We are very sorry the New Build Company solicitors have not received your funds so you can not move in. I call my solicitors who tell me sorry we can't find your money. It's vanished. I think we need a situation where it is no longer possible to profit from housing. So if house prices increase you can only rent it at the value you bought it or its initial rentable value.Dave Likewise you would only be able to sell it at cost price plus inflation. There would then be an end to estate agents (hooray!) and the whole ghastly mechanism of profiteering out of such a basic necessity. 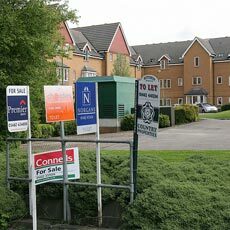 The house price rises of ten years ago have, in effect, created a currency devaluation for those who had not bought property prior to the housing madness and buy-to-let craze. 7 days ago I was asked to change completion dates to 1st August, was not happy but agreed and spent the Friday & Saturday rearranging removals, house insurance etc..... I did request at that time that my solicitor tried to get exchange done asap so that I could stop any further slippage, he has sat on his hands and now what 6 days later I am told they need another two weeks so they can get their broadband in place ( both work from home)......................... a chain of 6 have now been effected by the same persons twice, I do undertand that the law states until contracts are exchanged there is no recourse for us but morally and ethically this cannot be right .... perhaps the law is simply inadequate/out of date in this area. The only things I have done in advance are mail re-direct and arranged Sky to come set me up, I have even left self addressed stamped envelopes for any mail that slips through at my old address. Meant to exchange early it's week! Now Wednesday no two in chain of four,w are number four has not signed the contract yet! And his solicitor is out of the office today! No2 client has said he has an appointment for Monday to sign contract! Everybody is ready to move/ complete on Friday!. We have had our house on the market nearly four years! Twice it's fallen through after surveys etc if a solicitor is reading this they should understand how stressful my life has been! Four years and I'm still waiting and my solicitor doesn't seem bothered in the slightest!